A weakness in my dependency on Revak (http://www.villarevak.org/td/td_1.htm) was that that I had to assume that his "Etteilla School" attributions really did come from them, as opposed to Papus's imagination of them. Revak didn't use the Etteilla School's writings themselves, but rather Papus's alleged quotations from a 1791 book by one of them, as he explains in his Introduction. Revak gives no indication of having checked Papus's accuracy. I myself am not sure I trust Papus as an accurate historian. So I needed to check his sources. I couldn't get the 1791 book that Revak says Papus cited, the Dictionnaire synonimique du Livre de Thot. According to WorldCat, it exists in four European libraries, none of them in areas I planned to visit soon. Nor did I see anything resembling the word-lists in any of the books by Etteilla linked by Trionfi.com. But there is also the Grand Etteilla, which Decker, Depaulis and Dummett date to 1838, “or a trifle earlier”(A Wicked Deck of Cards, p. 147). It is by the Etteilla school, and according to Decker et al it had the word-lists. Since it seems to have been reprinted a few times, it is also possible that Waite would have had a copy. I could find no on-line edition, but it at least it had the virtue of being in a library relatively near me, the University of Nevada at Las Vegas. They in fact had two editions, one of ca. 1850 and one undated 19th century but with the right publisher and contents to be the 1838. The library would lend out neither of them, naturally enough. So I factored Las Vegas into my next vacation (an awful place, but the epicenter of some absolutely stunning state and national parks). I copied the whole book, less a couple of pages that stuck together without my noticing it. It is pretty interesting. Not only does it have all 78 "Etteilla II" designs (not Etteilla's, but added by Blocquel, the publisher, accoding to Decker et al), but also a section on the Rules for playing the game of tarot (according to Decker et al the same as the famous 1659 rules but with Etteilla's names for the cards; if so, that fact is not obvious) and some material on spreads, among other things..
Now at home, I compare what is there to Papus and Waite, as they appear on Revak's site. I find some things of interest. First, I compared the editor/publisher (Blocquel-Castiaux), place of publication (Lille and Paris), author (Julia Orsini), and contents (including pictures of the "Etteilla II" cards) to the account of the 1838 book in Decker et al. I see that it corresponds closely. Castiaux is merely Blocquel’s father-in-law. And although there is no date of publication, I can get a rough estimate by looking up the books in the "recommended reading" section at the end. It turns out (looking in WorldCat) that three of the books recommended were also published by Blocquel. Comments on WorldCat give 1839 or 1840 as estimates for the latest of them. I have given the documentation in another post here, No. 9 in "Etteilla Timeline and Etteilla card Variants - background." So 1839 or thereabouts is when the book was published, comparing well with Decker’s 1838. Next, I noticed that the "synonymes" are indeed there, and they do correspond closely to the lists in Papus, at least as far as I have looked, so far only at Batons. The only major discrepancy I saw was in the account of the Ace. Papus has "Naissance" (birth) etc. for the Upright and "Chute" (fall) etc. for the Reverseds, while the Grand Etteilla has just the opposite, in its "synonymes" section. Here is a scan of the passage (p. 139). But looking at the photos of "Etteilla I" cards in Decker et al, I see that Etteilla had "Naissance" for the uprights and "Chute" for the Reverseds, as can be seen by comparing the “Etteilla I” card at left above and the “Etteilla II” at right. So Papus, citing the 1791 source, avoided the Grand Etteilla's error (or correction of Etteilla) in his section on Etteilla. Waite’s account is the same as Papus’s. So he used either Papus or some other source, possibly the Grand Etteilla, but correcting this obvious departure from Etteilla’s original assignment of keywords. I found another section in the Grand Etteilla that strongly suggests that Waite did indeed use the Grand Etteilla of 1838 as a main source. In addition to the "synonymes," the book has a large section not quoted at all by Papus, probably because it wasn’t in his 1791 source. This section is called the "explication," with about a page on average for each of the 78 cards. Looking at these "explications," I find many correspondences between passages there and descriptions given by Waite but for which Revak has no correlation to Etteilla. In other words, Waite was even more dependent on the Etteilla School than Revak indicates. Here, as examples, are the correspondences in the suit of Batons that I noticed not noted by Revak. VALET : Waite’s “evil news” corresponds to Etteilla’s “elle anonce maivaise nouvelle a moins qu'elle soit suivié d'un des No. 17, 39, ou 63 egalement renversés" (it announces bad news, at least when it is followed by 17, 39, or 63 equally reversed). ACE: no significant additions to report, but the “explication” for this card follows the “Etteilla II” pattern of putting “Chute” for the upright and “Naissance” for the Reversed. It comments: "Une banqueroute complète, le feu, ou une maladie sérieuse vous sont prédits par ce tarot; la mort vous menace, mais vous y échapperez certainement.” (Complete bankruptcy, a fire, or a serious disease are predicted for you by this tarot; death threatens you, but you will certainly escape it.) And also: “Renversée, cette carte est un signe de naissance; elle annonce à vous et aux vôtres une longue postérité si elle se rencontre avec le No. 11.” (Reversed, this card is a sign of birth; it announces to you and yours a long posterity if it is encountered with No. 11.) Etteilla, of course, would have had Upright and Reversed the other way around. The dramatic difference here offers a good lesson in not taking cartomantic traditions too literally. It is clear from the foregoing that Waite has consulted the "explications" in Le Grand Etteilla, which Papus does not include, picking those he likes and ignoring Le Grand Etteilla’s cautions that some of them only apply when certain other cards are adjacent. Since the synonyms-lists are the same in the two books (Grand Etteilla and Papus), he probably used the Grand Etteilla in the preparation of his book; whether he used Papus as well is undecided. I also have sufficient evidence now that the word-lists cited by Papus are indeed those of the Etteilla School. It is not certain that they all come from Etteilla himself, but surely they are in his spirit, since we know that the keywords are his. And he may well have gotten these words, more or less, from Italian fortune tellers who had moved to Paris, as he claimed. Only the words that are more “différentes significations”—alternative meanings--than “synoynms” are more dubiously of Etteilla. It remains to be seen whether the additional material from the "Explication" adds anything to the interpretations of the Sola-Busca that I have made in the other Forum. I have no idea whether this material is authentic Etteilla or additions made by the Grand Etteilla author without reference to Etteilla or his sources. I have one Julia Orsini text that accompanies one of my 1890 Lismon Etteillas. Both stamped 1890 decks have the same reddish box--one a brighter, rich wine color and the box is intact, although the paper insert and edges are slightly cracking; the other has dulled into a kind of leathery brown color with age. There is no date, no street, only the "Lismon" name--and I will check that spelling on the boxes. The fresher red box set has the papery covered booklet with title pages in two sections, lengthwise, and a few odd graphics, but no portrait engravings. The pagination stops at page 78. I will try to copy the title pages, front and back. The French phrasing is unusual and perhaps by giving some samples sometime next week or a bit later, you might be able to date or match the text with your copied pages or the graphics might match your copy of the "Julia Orsini" or Simon Blocquel texts. I am afraid I will be gone for personal reasons the next week or so, but may be able to get the above samples to this thread it might be useful for dating/matching purposes. The reason I say unusual French phrasing is because there are some differences in the phrasing between the Lismon text and the circa 1900 Grand Etteilla Grimaud text. I will have to check if the circa 1900 Grand Etteilla from Grimaud has any text credits--from what I could tell so far, most of the Grimaud meanings come from the Lismon Grand Etteilla, with additional embellishments. A very good reproduction--although the deck this booklet comes with is also a distinct pattern variation--of the Art of Drawing the Cards similar both to the Lismon Etteilla and the Grimaud Grand Etteilla text with Julia Orsini meanings are in a bilingual French and English translation of the Editions Dusserre Jeu des Dames reproduction. I have never seen an original Jeu des Dames, so I do not know if that "Julia Orsini" text also was sold circa 1890-1900 with that particular Grand Etteilla pattern--but this is offered as a suggestion if you want to compare your Simon Bloquel Grand Etteilla texts. Tarotbear's Lair usually sells the bilingual Jeu des Dames at a very good price (I bought two in the past two years and both sets came with the English/French text in one booklet). Thanks for your quick response, Mary. The trouble with most time-lines is that they don't come with footnotes saying where the information comes from. So then later even the writer doesn't know the source. I've been caught on that myself, on the Tarot History Forum. Cerulean: the 78 page Julia Orsini text is probably the one that the librarian at the Wellcome Institute dated to c. 1850, since it, too, has 78 pages. When I get your samples, it will be interesting to see what relation it has to the 212 p. Julia Orsini text of c. 1838 in Las Vegas. Perhaps it is a condensed version. The c. 1838 Las Vegas Julia Orsini book's Ace of Batons has "chute" on top and "naissance" on the bottom. I posted a picture of it on a thread I initiated yesterday here (perhaps I should have just put the post here! ), to deal with the content of that book. [Edit added by MikeH April 10 2011: that thread has since been integrated into this one by the Monitors, for which I thank them; I am talking about what is post 11 here.] In the post, I contrasted this "Etteilla II" version with the 1789 "Etteilla I" card reproduced in A Wicked Pack of Cards. Here are the two, side by side, again. The c. 1838 Julia Orsini book's version is on the right. So it appears that the post-1900 productions that you are talking about restored Etteilla's original conception of the Ace of Batons. Perhaps they restored other features of Etteilla I. I think comparing other cards changed by the post-1900 productions with the 1789 Etteilla I designs would be interesting. Is there a good web source for the Etteilla I pictures? Or even print source? I have tried to bring them up from the trionfi.com site but without success. According to Decker et al, "Lismon" is a pseudonym used by Blocquel. I presume that the deck you call "Lismon 1890" is the same as the one originally put out by "Lismon" in 1838 (according to Decker et al) and depicted in the 1838 Julia Orsini. Decker et al call it "Etteilla II." The Grand Jeu de l'Oracle des Dames is what Decker et al call "Etteilla III," dating from c. 1865, they say (I erroneously said 1843 in my post, but that was a different Etteilla-derived deck, the "jeu de la princesse"), and published by Blocquel's son-in-law, Delarue. One difference, they say, between Etteilla II and Etteilla III is that Etteilla III affects a neo-Gothic style. Another difference is that on the Etteilla III's card 5 there are four "genuine quadripeds' (lion, horse, bull, elephant) instead of symbols of the four evangelists. (1) My 1838 Julia Orsini, 212 pp, that has engravings of the Eetteilla II cards. (2) Your 1890 Julia Orsini, 78 pp., that comes with an Etteilla II deck attributed to "Lismon." (3) Your c.1900 Julia Orsini booklet (about 78 pp.?) with slightly different wording than the 1890, that comes with the Grimaud "Grand Etteilla" deck (also Etteilla II?). There are also two more decks with accompanying book, which I mention to avoid confusion. The second is a revision of the first; both are given (by Decker et al) the name "la princesse Tarot." 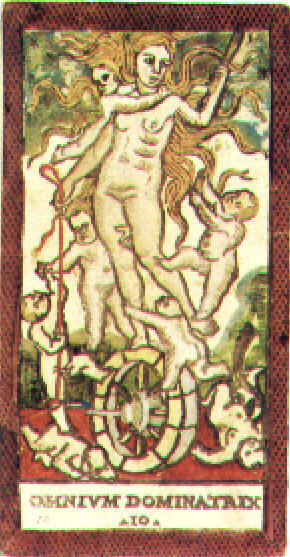 The first version was designed by Lorambert under the name Johannes Trismegiste and published with Jules Laisne, it first appeared in 1843 in a book called L'Art de tirer les cartes, revelations completes sur les destinees au moyen des cartes et des tarots, d'apres les methodes les plus certaines (The Art of reading the cards, complete instructions on fortune-telling by means of cards and tarots, according to the most reliable methods).. It was reprinted 1850. The book was printed again with new titles on the cards in 1864. Card 1 was called "King Thoth," card 2 was "Anubis," and 8 "the princess Tarot." "The accompanying book"--Decker et al do not say whether it is a new book or a revision of the previous one--"describes the Princess Tarot as a great prophetess of Thebes and of Memphis" (p. 150). So this deck was called the "la princesse Tarot" deck. Production was continued by Watillaux. However the reproductions of Decker et al's plate 7 are courtesy Editions Dusserre, Paris. So perhaps Editions Dusserre continued its publication later. Watillaux was active 1874-1908. One reason for mentioning this book and deck is that the book has a similar title to the 1838 Julia Orsini "Grand Etteilla, ou L'art de tirer les cartes." Also the publisher is perhaps the same as for the "jeux des dames" that you mentioned. It is possible that publishers did not distinguish between the two books, or their authors, and that librarians got them mixed up, too. And it is easy for us to mix them up as well. These books are of course interesting in their own right, as yet another branch of Etteilla derivatives. Having not seen them, I do not know what relationship they might have to the earlier "Julia Orsini" book. "Julia Orsini" appeared in 19th century as an expression for otherwise "Giulia Farnese" and also "Giulia la bella", who married in 1489 Orsino Orsini, became the lover of Pope Alexander VI c. 1492/93, was captured by the French army 1494, released for high ransom, became a public scandal, had her role as mistress of the pope till 1500. She died in 1522. Her brother was made cardinal by a favor of Pope Alexander and became himself Pope as Paul III (1534 - 1549). Through her intimacy with the Pope she was able to get her brother Alessandro created Cardinal. This earned him the title of "Cardinal of the skirts" from Pasquino. Are you saying that this was a made-up name (not surprising) that was supposed to evoke the earlier Giulia Farnese/Orsini in the minds of French book buyers, who were buying a book that was probably hobbled together by a hack writer at the publishing company? This was a pretty common ploy with fortune-telling books. That's fine by me, if it's really true. Unfortunately hacks are also prone to making mistakes, such as reversing "Chute" and "Naissance" in the Ace of Batons. Since the cards also make this mistake, and the cards were by "Lismon," i.e. Blocquel, perhaps the old theory that Julia Orsini = Blocquel is right. Perhaps he had some personal reason for doing the Ace of Batons that way, which then became holy writ until Papus or someone else then noticed the mistake. Another thing is that "Julia Orsini" gives a lengthy but quite spurious quotation from Etteilla; the book cited, Les sept nuances, is genuine but the quotation is not, Decker et al say (p. 149); the page "Orsini" quotes, 240, does not even occur in sept nuances, which does not have 240 pages. So even hacks insert themselves into the work, at least to the extent of mixing things up, Uprights with Reverseds and a quotation purportedly from one thing which is really from something else (probably not by Etteilla, in Decker et al's opinion, base on the content) or just made up. One question: why would the publisher use the name of such a notorious figure as Giulia Orsini for the alleged author? He's not trying to advertise his Grand Etteilla as a piece of chicanery, is he? If he were, few people would buy it. Or did his intended audience actually support Alexander VI as an unfairly maligned pope? Or is the publisher counting on no one's having heard of Giulia Orsini and making a private joke at the expense of his customers, which only people who knew some history would get? I tend to think the latter, given his spurious quote from Etteilla. And to Mary, another question, since I am trying to separate genuine from fake Etteilla School material. For Etteilla's deck of 1789, you give extensive astrological correspondences for the trumps and the suit of coins. I presume you are basing yourself on Papus. Kaplan (Vol. 1, pp. 4-5) gives a different set of correspondences--although it's hard to figure out, because the correspondences are to the Marseille trumps (and to nothing in the suit of coins). His reference is to a summary by Oswald Wirth, 1927 (no specific book or page number given). A forum search of Lismon Etteilla touches on the upright Chute-but I only mention it as no one else seemed as obsessed as myself, and Kenji posted a picture on his website this card in color. I also noted the translation of Papus' Divinatory Tarot had followed the idea that birth /naissance was upright, as did Waite's Key to the Tarot. ...end of card meaning.....more on the cards later..
And just a felllow traveller's sigh...the obscurities of the so-called- Etteilla patterns do show up in such odd places and to me are linked with 19th century folklore, romantcism and may be too divergent and wayward to yoir main goals. The pretty cards of Grimauds various decks circa 1900 to me just seem like lovely nostalgia of cartomancy. ...Who is right? 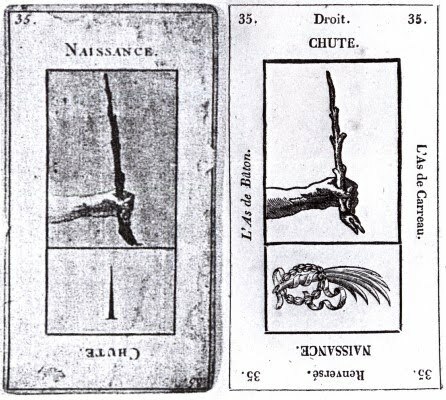 According to Decker et al (p. 87), the correspondences were in the fourth "cahier" (volume) of Maniere de se recreer avec le jeu de cartes nommees tarots, p. 18, published 1785. In a footnote (46, p. 274) they add that "this fascicule and its supplement have recently been reprinted in Halbronn 1993." That is Jacques Halbronn, Etteilla. L'astrologie du livre de Thot (1785), suivie de Recherches sur l'histoire de l'astrologie et du tarot par Jacques Halbronn, according to their index. But they don't say what the correspondences there are. Did you happen to check Halbronn? It would save me some work. Anyway, your time-line should give 1785 for the correspondences (whatever they are), not 1789, since they are not on the cards but in the fourth and last "cahier," 1785. Actually Decker et al have misled you here. They only state that the fourth cahier and Supplement are mostly devoted to astrology, and that the book offers equivalences between the Tarot cards and astrological "values", allowing the questioner to fix a birth chart. 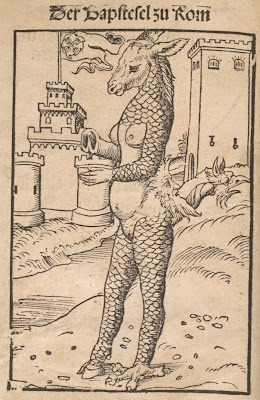 In fact the cahier seems to be mostly devoted to the notion that the cartomancer should utilize the priniclples of astrology and and astrological elections in general to empower his/her readings, but only in a very general way, dwelling on astrological lore but hardly mentioning tarot cards in any specific manner. Certainly there ar no astrological/tarot card correspondence charts or anything like that. So Hallbron's book wouldn't help you anyway. I don't know, what "the same name" means for the given 19th century situation. Either an "artist name" of a cartomancer or a book producer or just "accident". Interestingly in 1505 Giulia married her daughter Laura (likely from Alexander VI) to Niccolo Rovere, nephew of pope Julius. This caused, that she moved to a region near to a cold volcano about 70 km North of Rome (near Viterbo). Later her brother, the cardinal and later pope Paul III. 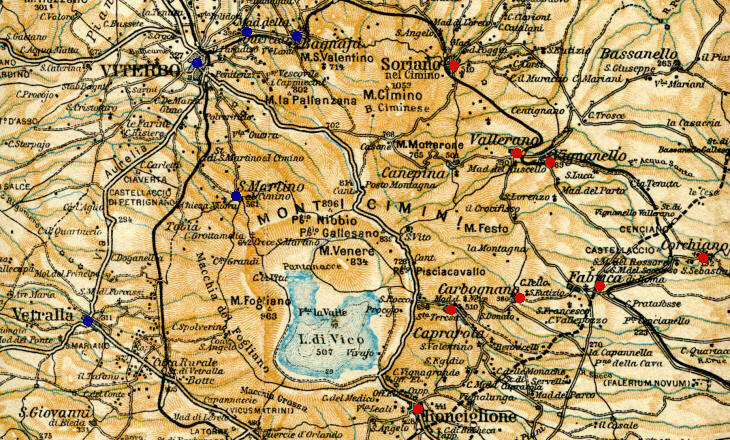 got some territory in this region, beside other locations also Ronciglione, which received a special privilege for playing card production, inside the papal states. So a flourishing playing card industry developed here (with insecurities about the begin of it, as "secure" is assumed the end of 16th century) and lived at least till 1700. It's proven, that they produced also Minchiate cards. In the time, when Pope Julius still was Giulio Rovere, cardinal since 1471, he had the office of Avignon, which was then an independent papal state near to the French territory. When Alexander VI was chosen pope in 1492, Giulio (his foe) found reason to escape quickly to Avignon. Avignon became then a major playing card production location. The business started to go bad, after Giulio had left the region (becoming pope in 1503). Perhaps Julius had realized the importance of the playing card business already in Avignon and took care to develop something, which would be later under the control of his family (his nephew Niccolo, who married Giulia's daughter ?). Perhaps this promising business passed in the hands of the Farnese ... at least we have later Ronciglione producing playing cards and Ronciglione in the hands of the Farnese from 1530 (?) till 1649. Constance Leber, a collector, published in the 1830's about his collection ... beside many other items he had also playing cards, between them some old Tarocchi cards. 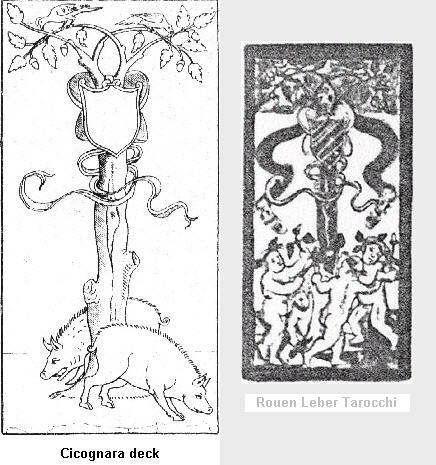 These decks were later sold and are now in a Museum in Rouen, either called Leber Tarocchi or Rouen Tarocchi. The cards show partly the Rovere oak, a heraldic device, as a suit sign. The Catalog: "Catalogue des livres imprimés, manuscrits, estampes, dessins et cartes à ..." By Bibliothèque municipale de Rouen, Constant Leber (1839) (Vol. 1 of 4 ... includes the playing card collection). Vol. 1-3 comprise the collection of M. Leber, which he presented to the Bibliothèque municipale, Rouen, in 1838. Vol. 4 comprises, in addition to indices for the complete work, a catalogue of the books acquired by Leber after his first collection was ceded to the city. 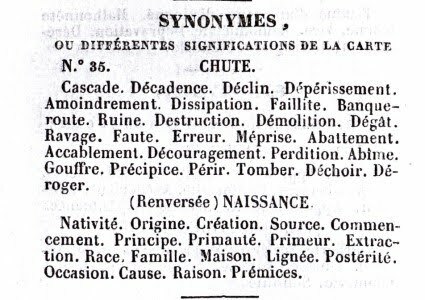 This (second) collection was sold by L. Potier, November, 1860.